The government of the Republic of China (Taiwan) would like to express deep appreciation for the assistance of the international community in relief aid and efforts in response to the devastation caused by Typhoon Morakot. Morakot was Taiwan's worst natural disaster in at least 50 years, causing over $1.5 billion in damage and leaving at least 7,000 people homeless. The typhoon brought six feet of rain in three days, eight times as much rain as New York receives in the entire month of June. The typhoon would have caused massive damage regardless of preparatory measures; however, unlike China's Sichuan earthquake or Taiwan's 9/21 earthquake in 1999, a typhoon is inherently more difficult to evaluate and respond to rapidly. As noted by the head of Taiwan's relief operation Mao Chi-kuo, earthquake damages are far easier to assess as their destruction occurs within a short amount of time. The area hit by Typhoon Morakot was spread over expansive mountainous regions, and the immediate strike was followed by several days of heavy rains, severely complicating the ability of helicopters and other rescue and relief efforts to break through. At a press conference on August 18th, President Ma stressed that while governmental officials had made mistakes that would be investigated and resolved in the future, the extraordinary effort shown by many rescuers and volunteers should be acknowledged. Many of those involved in relief operations worked day and night for 10 straight days, and six were killed while serving in relief work. Huang Chi-min, the National Fire Agency's director general, even fainted of exhaustion after days of stressful work with little sleep. The phenomenal labors of rescue workers during this crisis cannot be overlooked. The president noted as well that the disaster has been a tragic but unifying moment for the people of Taiwan, and that once the current devastation has been fully repaired the next step is to look proactively to changes that can be made. 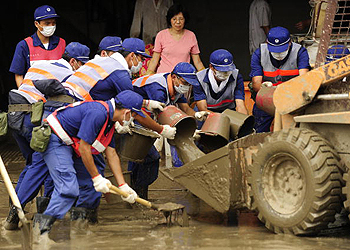 He noted that the process of reviewing Taiwan's disaster prevention and rescue mechanism has begun, and in the future the government plans to provide more personnel, a higher budget, and branch offices to establish an elaborate system of disaster prevention and rescue. Currently, the top priority in relief efforts is evacuating victims from disaster areas. As of August 18, helicopters have rescued 8,800 people from remote mountain regions and have delivered over 30,000 tons of supplies. Still, more must be done to adequately respond to a crisis of such scope; the government is committed to increasing the speed of relief efforts and providing post-disaster help to victims and survivors. This includes housing and daily living subsidies as well as the "8/8 Temporary Employment Project," a program with the dual goal of enabling typhoon victims to work to clean their communities while earning an income. In dealing with an issue of such large scale, however, Taiwan cannot work alone. We are sincerely grateful to the multitude of nations and international organizations that have already reached out in aid. In such difficult circumstances, feelings of fear, anger, and frustration are inevitable. The government hopes that, together with the assistance of the international community, significant progress can be made in providing relief to those affected. Tony Ong works for the Taipei Economic and Cultural Office in New York.